Imagine a manufacturing unit without any human presence with robotic arms performing mechanical actions, connected digital machines calibrating and diagnosing themselves, forecasting their sickness and calling the correct “specialist” for preventive maintenance!!! That is the fourth industrial revolution, the factory of the future, the Industry4.0 !!! And that is the vision CoE’s hopes to strive towards via its Co-create program. When robotics, 3D printing, data analytics, the Internet of Things, and digital fabrication are joined together, they integrate the physical and virtual worlds. Whether you are a startup / freelancer who has developed a cool piece of technology relevant for Industry 4.0 (sensor, gateway, analytics) or a system integrator capable of delivering complete solution or an industry user looking to use technology for improving operation efficiency, the co-creation program is the right place for you. As part of this program we bring together the industry users, technology creators, system integrators and enterprise partners together for development and adoption of innovative solutions to the real world problems. Being part of the program provides you with a huge ecosystem connect which is constantly updated by CoE. Are you a startup looking for incubation? Apply below! The Center of Excellence for IoT India, at Bangalore, is a Digital India Initiative to jump start the IoT ecosystem in India taking advantage of India's IT strengths and help country attain a leadership role in the convergent area of hardware and software. The main objective of the CoE IoT is to help Indian IoT Startups leverage cutting edge technologies to build market ready product. 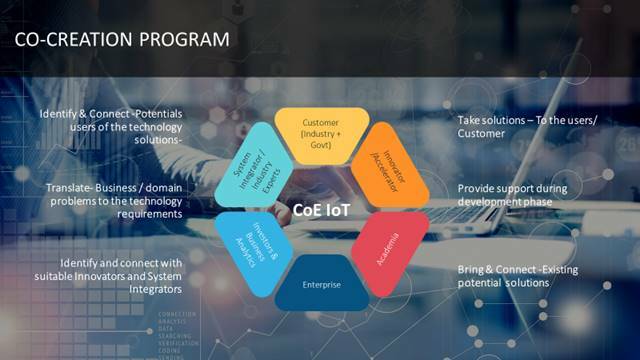 Through IoT Startups Program , we aim to build industry capable talent in an entrepreneurial ecosystem by providing Incubation, Funding, Acceleration, Industry Connect and Mentoring.